Pasta with Smoked Ham and Baby Peas in a light cream sauce is loaded with baby peas to give this dish a delicate flavor while the Black Forest Ham gives it a nice smoky flavor to the pasta. 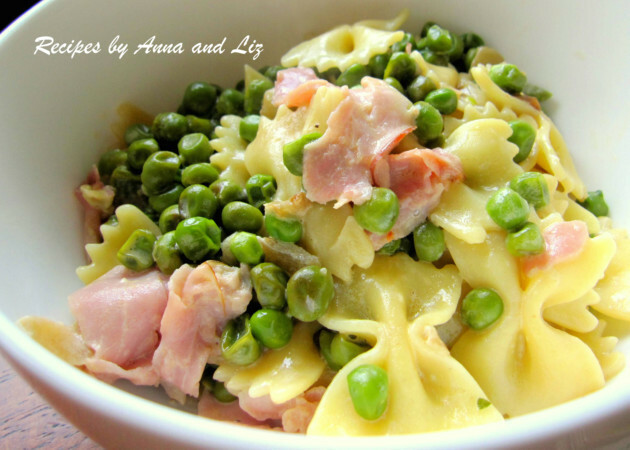 Full flavor and so yummy, this pasta with smoked ham and baby peas is one dish you’ll enjoy making for years to come! Mom always makes this dish with Italian prosciutto di Parma. But I decided to try this recipe using a different cured meat. The Black Forest ham is a moist ham that is cured and smoked over pine which gives its intense flavor. Black forest ham is not only tasty, but it adds a wonderful flavor to the light cream sauce. I decided to use farfalle pasta because they’re shaped into cute little bow ties, and they’re kid friendly. If your kids love pasta, then this recipe is a great way to get the kids to eat some vegetables. Try it! Pasta with smoked ham and baby peas is a great dish for dinner, serve as a side dish or as the main course with a mixed green salad and dinner is ready! Pasta with Smoked Ham and Baby Peas in a light creamy sauce makes this dish fabulous and one you'll make for years to come! In a large non stick skillet. Heat olive oil with 1 Tbsp. of butter (reserve the other tablespoon for later). Add the onion and sauté' for a few minutes, until onion is golden brown. Add cayenne pepper, frozen peas and water. Cover with a lid. Simmer of low-medium heat for about 5 minutes. Stir occasionally until the peas are soft and tender. Season with salt and pepper. Lower the heat. Roll the slices of Black Forest Ham together and chop into small pieces. Toss the Ham into the skillet. Turn off the heat. In a large pot of boiling water. Add some salt. Add the Farfalle Pasta ( bow-ties pasta) into the boiling water. Follow the directions to cook the pasta, until the pasta is al dente. With a medium size strainer, take out the pasta and transfer the pasta to the skillet with peas and ham. Turn the heat back on low, add in 1 tablespoon of butter and Half and Half. Simmer for 2 minutes. The sauce should be smooth and creamy. Taste and season with salt and black pepper to taste. And serve! If you try this recipe, let us know and leave a comment! Snap a photo and hashtag it on Instagram @2sistersrecipes, and on Pinterest. We’d love to see what you cook! I made this dish last night and it was delicious! It was very easy to make and will definitely make it again! Thanks Su ! I am so glad you love our recipes ! If you have any questions about anything let us know !! Wonderful, wonderful even with gluten free pasta. My girls will love this – actually so will I!